LISA represents new approach to chess clock focused to current needs of players and arbiters. 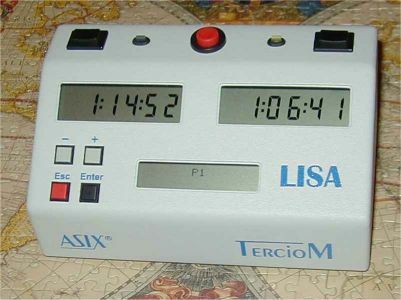 LISA is not only a clock. Thanks to microprocessor inside it works even as a computer optimally supporting all typical situations which occur during a play. Control using Menu - intuitive, nearly "without a manual"
LISA is once only cost! LISA allows to change its features in the future, e.g. adding new play modes and functions requested after changes in FIDE laws or play rules needs.